A complete set of split ring anodes for use with an adapter plate that enables anode replacement without propeller removal. 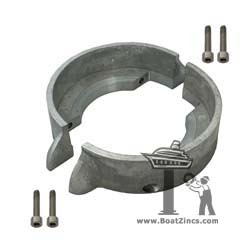 Fits Volvo Penta 120, B, C, D, E, MS25S , MS25S-A, MS25S-R, S120C saildrives. Mounting screws (4) included. 3mm hex wrench required for installation. Mounts on previously installed adapter kit.